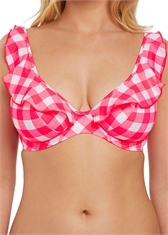 Discover Freya's Totally Check Italini co-ordinate. The vibrant tropical print gingham design features a decorative frill along the waistband to complete the retro look, sitting low on the hips with a cheeky cutaway back for less coverage. Available in sizes XS-XL.